Printed Party Sashes - Video Help - My Party Wear! Video from mypartywear.co.uk showing the available range of Printed Party Sashes. If you don't want to search through the site to see what we do, then why not sit back and let this 60 second video give you an overall view of what we can offer for your party, with our great range of Printed Party Sashes. 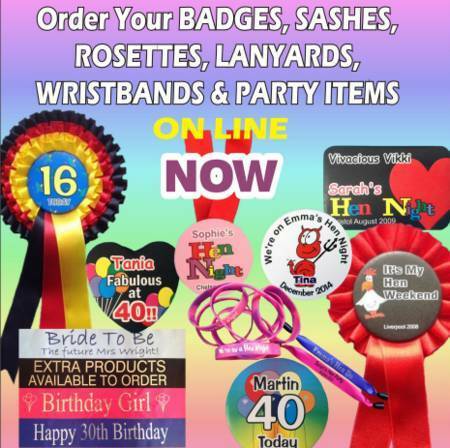 We can supply your Party Sashes for any kind of event - product promotion, exhibition, hen night, birthday. Our Sashes are available in a range of ribbon and text colours. When you have finished watching the video - don't just stop at our Sashes. Take a look at our other customised party products on the website. Visit mypartywear.co.uk for further information on Printed Party Sashes. Buy your Printed Party Sashes now. If you would like to have a sash of a different length than our standard then just let us know. the normal length is 1.8M or 6 feet. It is better to tell us if you need a differenrt length. If you try and cust down a standard length then then there is always the possibility that the text will not appear in a visible position on the resulting sash. This is particularly noticeable if you have print on the front and the back.